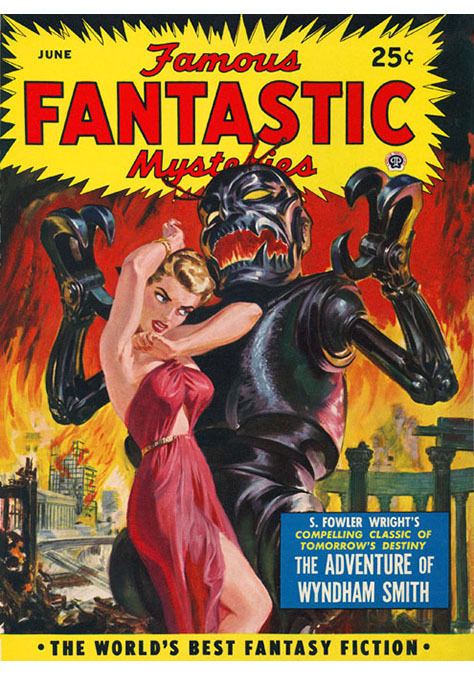 I spotted this dramatically illustrated paperback cover last fall in the blog Pulp International, and promised myself I would also make use of it someday on this page. 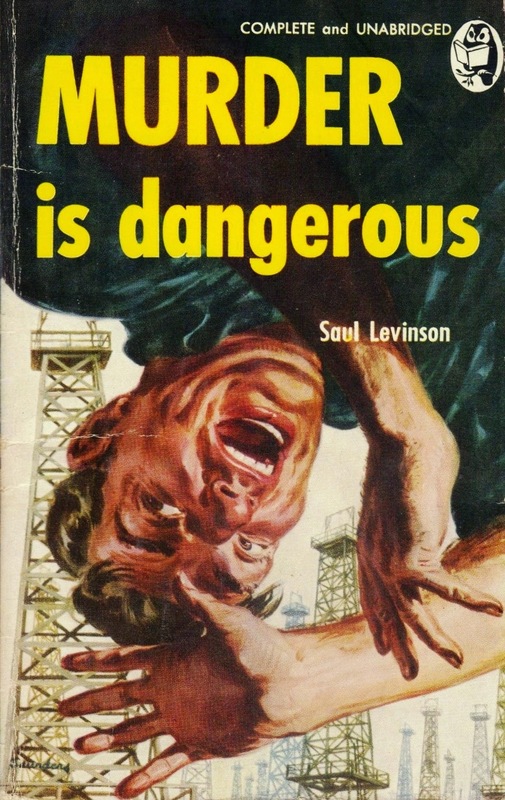 But my efforts since to learn anything remotely substantive about Saul Levinson, credited as the author of Murder Is Dangerous, have been more than a bit frustrating. He appears to have penned only one other novel, Red-Hot Murder (supposedly containing “All the Thrills of a Wildcat Gusher”), which like Murder Is Dangerous, was originally published in hardcover in 1949 by New York-based Phoenix Press. And his short tale “Stay on the Sidewalks, Kid” appeared in the August 1955 edition of Ellery Queen’s Mystery Magazine. Other than that, however ... nada. In his amusing 1982 book, Gun in Cheek: A Study of “Alternative” Crime Fiction, Bill Pronzini casts Saul Levinson in the “unknowns” category, together with such other Phoenix Press scribblers as Helen Joan Hultman, H.W. Sandberg, Arville Nonweiler, Oliver Keystone, Gilbert Eldredge, Stewart Vanderveer, Amelia Reynolds Long, and Robert Portner Koehler. From the minute he struck the oil fields Harry Witstow was warned to move on but he stubbornly refused. He had a contract, this was his big chance to make good--and there was a certain girl. Then his friend Pete met a violent death, his crew rebelled, a powerful competitor started freezing him out ... and then those sinister notes started arriving, first warning him, then threatening his with death. And in the dark shadows of the shacks and derricks stalked a crazed killer bent on making good his promise. Handi-Book summed up Murder Is Dangerous as “a thrilling, tense mystery of murder in the roaring oil fields.” The story certainly has its dramatic moments, as equipment is sabotaged, Witstow is undermined by his associates, and the local sheriff pins responsibility for all of these troubles on geologist Witstow himself. If Levinson’s protagonist doesn’t catch on right away to who really is to blame, he at least figures it out eventually, thanks to some help from a crusty and intriguing mentor called Driller, and Norma Morris, the witty young daughter of his pipe dealer. 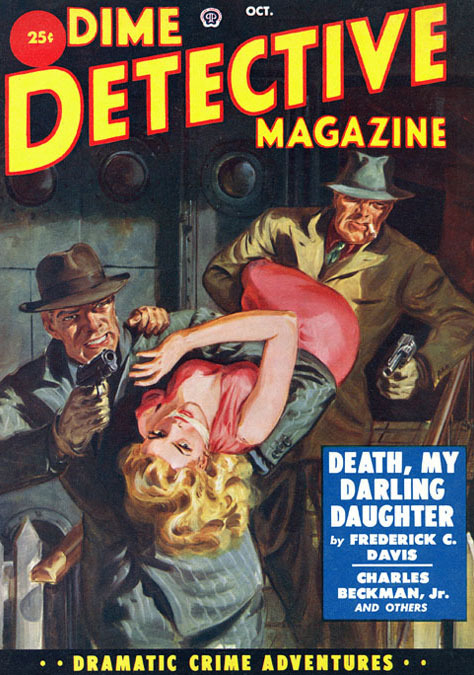 Norm became a top cover artist for dozens of magazines like Eerie Mysteries, Ten Detective Aces, Wild West Weekly and Saucy Movie Tales. “Before [World War II], I sold a hundred paintings a year for 25 to 75 bucks apiece, which was quite a chunk of change in those days! I was riding in style, right smack through the Great Depression!” His studio cost only $35 a month. He had a shave, shine and manicure every morning and he went ... for dinner and dancing at the [New York] Biltmore Hotel. 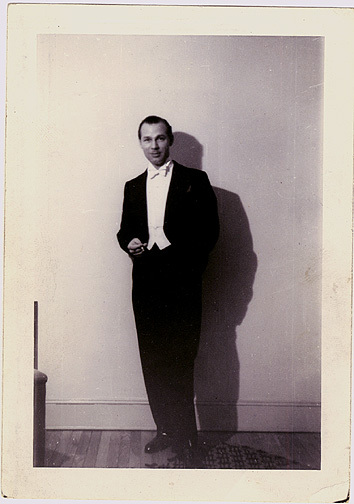 Norm was such a snappy dresser that one night as he entered the Hotel Astor, a mob of fans shouted, “It’s Harry James! !” He literally ran for his life as they tore his tux to pieces! Norm had two cars--a Buick open-car and a Pontiac convertible, which both sat undriven in a parking garage that cost more than the average rent. He hired his favorite models every day from a local agency, but often desperate young women would find there [sic] way up to his studio, ring the bell and drop open their robes when he opened the door. If he was all booked up, they might suggest other more intimate services. As Dad reported it, he had pity on them--dressed them and sent them on their way with a hand-out, and with a tear in his eye. World War II interrupted Saunders’ career. He was drafted into the U.S. Army and spent a year with the military police “before being trained in camouflage and sent to paint gasoline storage tanks along the Burma Road in China for the duration.” Later, he returned to New York, married his fetching young Greek studio model, Ellene Politis (with whom he would eventually rear four children), and resumed his efforts on behalf of pulp magazines. Until that industry finally burned out in the late 1950s or early ’60s, Saunders “was in constant demand ...,” according to one online biography. 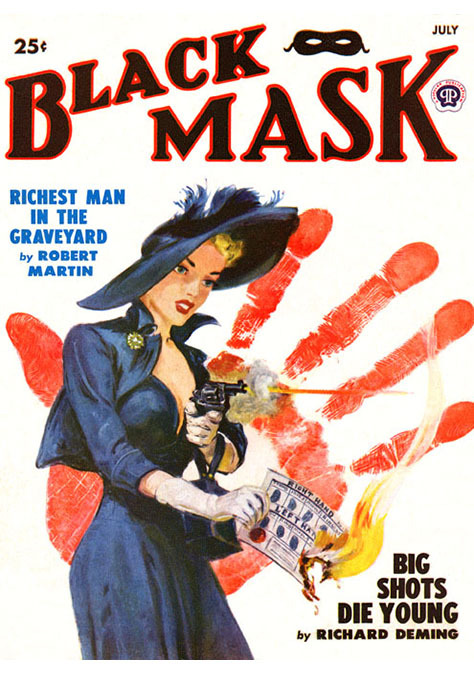 “During this period he added another 421 pulp covers to his lifetime total of 867, which is the highest number of covers painted by any pulp artist.” His artistic depictions--many of them demonstrating a particular fondness for the curves and crevasses of the female form--graced the fronts of Black Mask, Famous Fantastic Mysteries, Dime Detective, Marvel Science Stories, and many other periodicals. 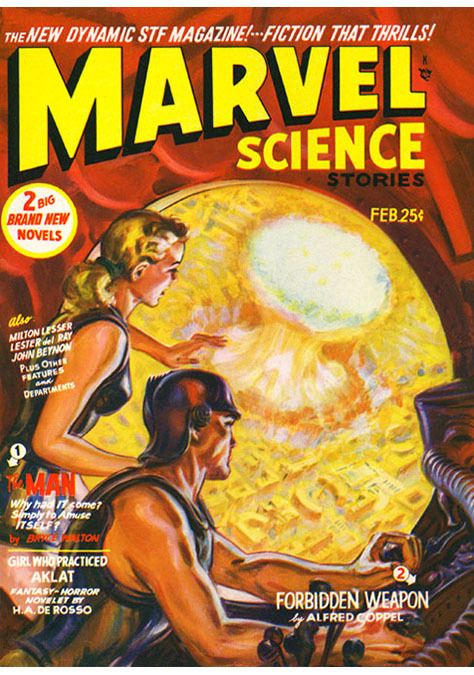 Comics were still evolving in these early years and they often had full-color covers painted by pulp artists, and their stories were filled with the same shocking pulp-fiction thrills. However, these products were being distributed along with innocent kiddie comics and this shared marketing raised many censorial eyebrows! The fact that Dad’s covers looked realistic, made their horror all the more gruesome. Letters of parental complaint led to a public campaign for the government to regulate “the trash we expose our children to!” This is a whipping-horse that still appeals to today’s political opportunists. My father’s painted covers were so nightmarish that the United States Congress actually passed a Comic Book Code of Decency Act to protect American youth from his kinds of images. How many kids can say that! The legislation was swept along with the general drive to crack down on “un-American activities” and by 1954 my Dad’s controversial style of work was black-listed from the comics. Fortunately, he could fall back on freelance projects for paperback book publishers, men’s adventure magazines, and even children’s trading-card manufacturers. For release in 1961, and to commemorate the 100th anniversary of the outbreak of America’s dreadful Civil War, Saunders developed a line of cards for the Topps bubblegum company that, his son says, “depicted battle scenes of such bloody realism that Topps was flooded with letters of complaint.” The painter subsequently created the Mars Attacks series, which imagined an invasion of Earth by ugly, remorseless Martians (and more than three decades later inspired a science-fiction film). Although I didn’t know it until recently, my own introduction to Norman Saunders’ artwork came in the mid-1960s, when he (along with Bob Powell and Maurice Blumenfeld) produced a line of Batman trading cards. My recollection from those boyhood days is that there were several sets of these cards, with illustrations on one side and little adventure scenarios on the reverse, and they came inside 5-cent bubblegum packets, a few random cards at a time. I must have chewed a whole lot of bubblegum back then, and swapped wisely with my friends, because I wound up with--and in fact still own--130 of those vintage Batman cards. I have thought ever since that I held a complete collection of the first three sets (before the painted scenes gave way to photographs), but apparently there ought to be 143 cards in my possession. Oh, well. I’ll be happy with what I have. At the height of the hoopla over ABC-TV’s campy Batman series, Saunders was hired by Topps to produce a line of bubblegum trading cards that depicted the Caped Crusader and Robin, the Boy Wonder, in dozens of precarious situations facing such familiar villains as the Joker and Catwoman. Norman Saunders accepted his last freelance commission (for the front of Geoffrey O’Brien’s Hardboiled America: The Lurid Years of Paperbacks) in 1981. Six years later, he retired to live with his wife in her eastern Nebraska hometown of Columbus. There he died of emphysema on March 7, 1989, at age 82, leaving behind a wealth of recognizable and justly honored work that lives on in collectible paperbacks such as Murder Is Dangerous, as well as in the memories of children of the 1960s, like me, who were big fans of Saunders’ material even before we knew his name. READ MORE: “Picturing the Pulps: An Interview with David Saunders,” by Steven Heller (Voice: AIGA Journal of Design); “Masters of Illustration Art: Norman Saunders,” Part 1 and Part II, by William Horberg; “Scott’s Classic Comics Corner: My 12 Favorite Covers of All-Time” (Comic Book Resources); “A Tribute to Norman Saunders,” by Evan Lewis (Davy Crockett’s Almanack of Mystery, Adventure, and the Wild West); “Life with a Pulp Icon: An Interview with David Saunders,” by Laurie Powers (Laurie’s Wild West). Fantastic post. Great to see the blog back in action. I particularly like the Worlds of Fear cover - pulp meets Orwell. Thanks for the welcome back, Rob. I enjoy writing this blog, but the research necessary for any particular post can take a long time. I've just discovered your blog in my search for the artist who did the Halliday, The Corpse Came Calling cover. I loved the Norman Saunders piece and am extremely excited to work my way back through your earlier pieces. Keep up the great work, I'll be following avidly.